I love this product so much for my brows it makes them look natural but defined . Would definitely recommend ! Lexi has rated on date 04/21/19 as The Best ! 😍I love this product so much for my brows it makes them look natural but defined . Would definitely recommend ! with 4.5star. The color was as expected and I like that it comes with a brow brush. Dani Liblang has rated on date 04/16/19 as Great brow pencilThe color was as expected and I like that it comes with a brow brush. with 4.5star. Brow Wiz is the best eye brow that I have EVER purchased.\nMatches the color of my brows and hair perfectly. Easy to use, blends quickly with no fussing and fairly priced. I have purchased drug store brands to high end department stores brands over the years, Brow Wiz hands down is the best I have ever used. Debbie has rated on date 04/06/19 as Eye BrowsBrow Wiz is the best eye brow that I have EVER purchased.\nMatches the color of my brows and hair perfectly. Easy to use, blends quickly with no fussing and fairly priced. I have purchased drug store brands to high end department stores brands over the years, Brow Wiz hands down is the best I have ever used. with 4.5star. Brow Wiz is the best eye brow that I have EVER purchased.nMatches the color of my brows and hair perfectly. Easy to use, blends quickly with no fussing and fairly priced. I have purchased drug store brands to high end department stores brands over the years, Brow Wiz hands down is the best I have ever used. Bad bich has rated on date 03/30/19 as Very goodIt’s very good with 4.5star. Nicole Tauzin has rated on date 03/22/19 as Love itI purchased the shade Auburn to match with my current hair color and I love it. I want to buy my natural shade now. It gives my brows such a soft look compared to what I normally do, which is pomade. I love using it when I do simple eye looks or on my \"no makeup\" makeup days with 4.5star. 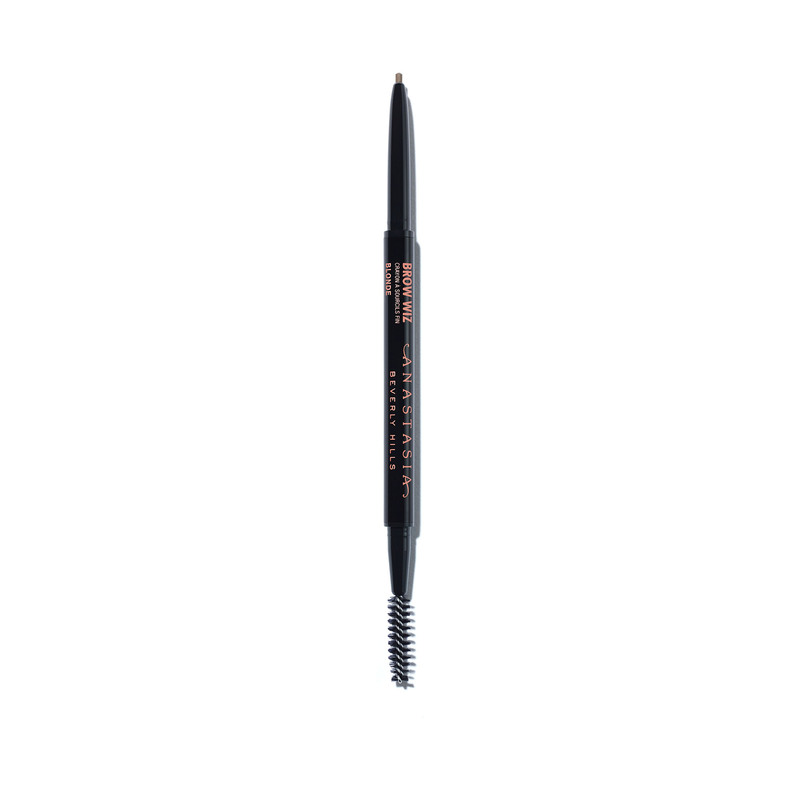 Anastasia Beverly Hills Brow Wiz® is an ultra-slim, retractable pencil that is ideal for outlining and detailing brows. The unique wax formula adds texture and creates the appearance of fuller-looking brows with ease and flexibility. Use the fine-tipped pencil to create tiny hairlike strokes in areas where there is sparseness. Then, use the spoolie end to blend for a natural-looking finish. Start by outlining the under arch of the brow, moving toward the tail end, then blend using the spoolie end of the brush.